Cats may seem absurd, aloof or simply independent to us. There is more to them, and maybe you have yet to experience it or you simply want more affection. We crave their attention. We love those snuggles and we love feeling their soft fur. You've probably often asked yourself, "I wonder how I could convince Garfield to interact with me more?". 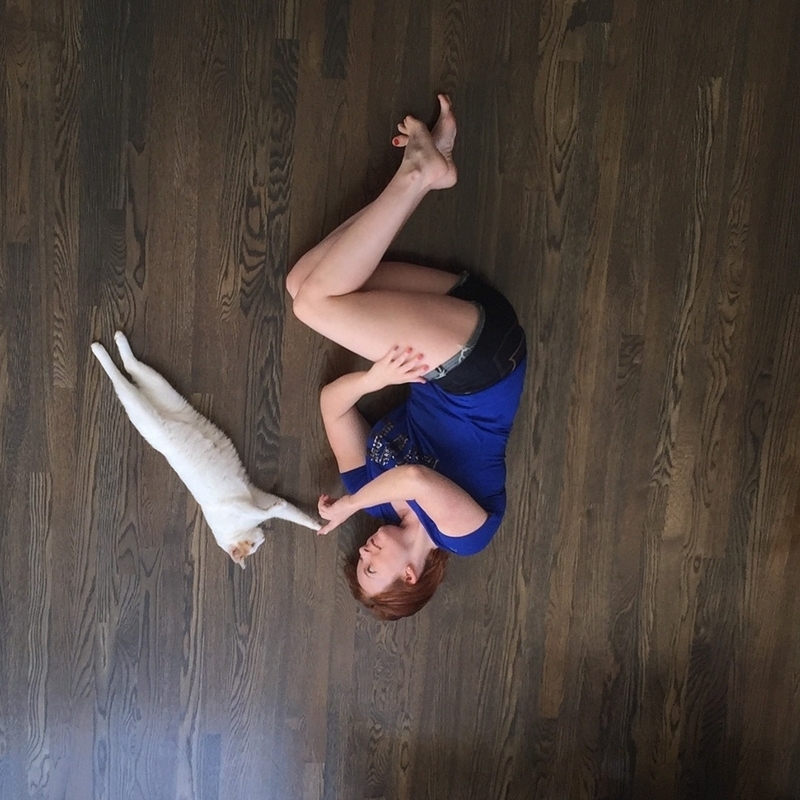 Here are 5 ways to increase the depth of your bond with your cat - ready? It's important to find time everyday, even if it's only 5 minutes, to sit alone with your cat. When I say alone, I mean in a room, without distractions like kids, spouses, loud trucks passing by, other animals, etc. During this time, just sit with him or her. Only interact if the cat chooses to interact with you. You can solicit engagement by slowly blinking your eyes then looking away as a sign of trust, as well as laying on the floor. Your cat determines the activity - not you. Observe when your cat is most interested in you during the day, and pick this time as your alone time with him or her. Is it when you come home from work? Is it right after meal time? Is it in the morning, right after you get out of bed? Lady Asti and I having a quiet moment alone. In recent times, cat culture has pushed cat guardians to keep cats indoors mainly out of concern of safety and health - which are both totally valid. It is true your kitty will likely live longer by being kept indoors. On the flip side, we have removed the cat's natural environment. Most cats would love some time outside, so wouldn't it be wonderful to let them have that time with you? Just imagine, strolling down the boulevard at sunset with your special feline friend. Maybe you'll even meet some new human, canine, avian or reptile friends! You will both enjoy this bonding activity! Before embarking on your outdoor adventure, be sure to go in proper fashion. There are three options: limited free roam, leash walking and a pet stroller. 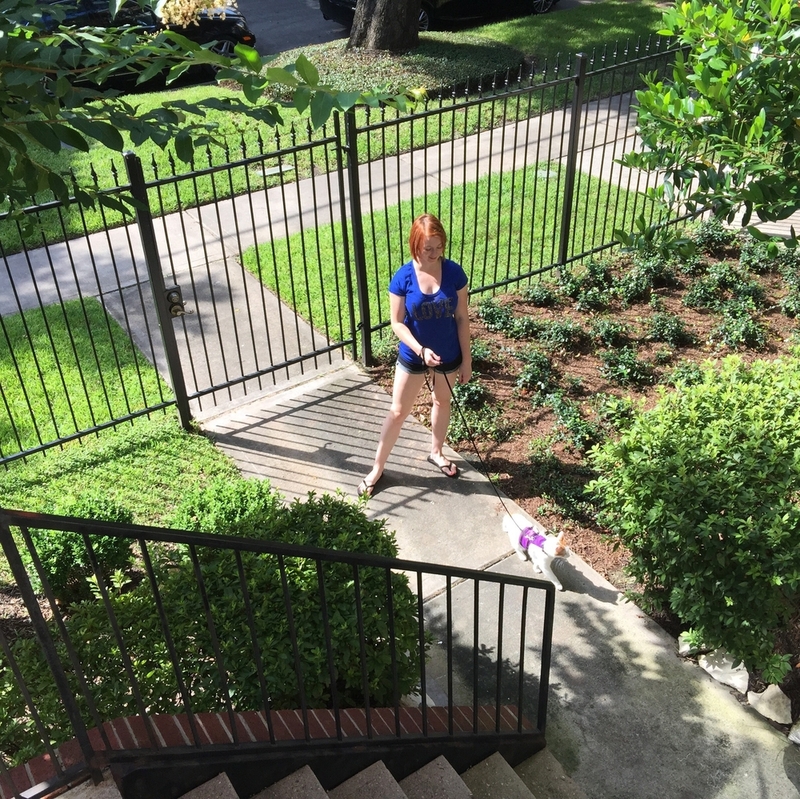 Limited free roaming includes setting up a cat-safe fence (see links at the bottom of the post) and enjoying time together with your cat on your patio, backyard, etc. A great activity if you are interested in reading outside in nature while your cat basks in the sun or sits in your lap. Leash walking is a great option for boisterous, outgoing cats who respond well to clicker training and/or are not distracted or scared easily by noises, smells, etc. Pushing your cat in a pet stroller is a great option for cats who aren't very adventurous, but still enjoy the sights and smells. It's also a great option if you live in an area with lots of dogs on a leash, because your cat is elevated and enclosed from well-meaning all-too-friendly pooches who are clueless about feline etiquette. As I like to say, it's a stress-free way to "stroll together & soul together". Lady Asti and I on our walk outside. Yes, you may think this is silly, but there is some awesome rewards in it for you, too. There's a few things that talking out loud to your cat can do to increase the closeness of your bond. First of all, your cat has probably already learned to meow at you when he or she wants something from you. Take that opportunity to talk back, and reward the cat with the play, food or pets that it desires. You have now positively associated meow, talk and play/food/pets together. You've learned of one way to communicate with each other. Second of all, on a spiritual level, when you talk, you are also setting an intention. This intention is what your cat (or any other animal, for that matter) can pick up on and understand. So, yes, when you call your cat those funny nicknames like Poopybutt, Fatty, and Dumby - they understand those words, because they understand the intent you had behind them. It's all energy. Jack and I having a little chat about our day. Playtime is a mimicking hunting prey, and it's the most fun activity a cat can engage in. If you make time to share that exciting moment with your cat, everyday, you will reap the rewards of companionship. Imagine if your favorite activity was skydiving, and everyday your favorite person said "Ok, let's go skydiving because you love it, then we'll go eat a spectacular meal once we've worked up that appetite". You'd think that was pretty pawsome, right? Now, just to clarify, cats do not hunt in groups. Unless it's a lion, which I sure hope you don't have a lion. You are sharing in an experience by being present during the play and providing the stimulation, but you are not "hands on" in the play time. That means, your body should not be "in the play", only the "prey" (toy) should be. Playtime with Bailey and Lady Asti. I would vote that clicker training your cat is the fastest way to increase your bond together. There are lots of books written on how to clicker train, so I will not dwell on that here. If you have multiple cats, like me, train them one at a time otherwise it turns into a food fight. Just know that the activity is very exciting, rewarding and fun for your cat. It's like a fun game with food to them. I don't know about you, but I love games that involve food for myself, too! 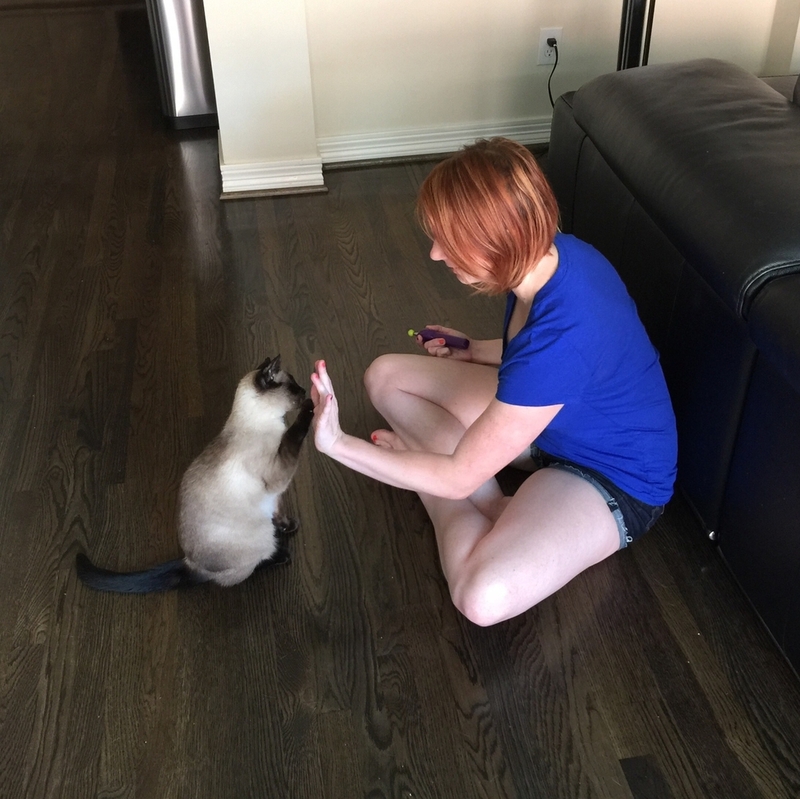 Captain Jack Sparrow and I clicker training for high five.